Although the land and the house were occupied by Stanislas Aubry's family before 1886, it belonged to Joseph Major at the time. He was the son of Elmire Biroleau dit Lafleur, second wife of Stanislas Aubry of Sainte-Scholastique, a "mill builder", or millwright. They had three children, Edmond Stanislas, Joseph-George and Marie-Louise. They moved to Hull in the late 1860s. On May 10, 1886, the house was one of about 110 buildings destroyed in a fire in the area bounded by Main, Laval, Wright and Leduc Streets. A new house must have been built soon after, because, on October 1, Joseph Major, Elmire Lafleur's son by her first marriage, gifted to his half brothers, Edmond-Stanislas and Joseph-George Aubry, the ground "with its buildings" on Lot 447, the site of the present house, leaving the usufruct of the property to their mother. The donor, who lived in Pueblo, Colorado, was visiting Hull. A deed of loan, registered one month later by the Aubry brothers, confirms the presence of buildings on the lot. These would be destroyed in the Great Fire of 1900, and the house of Edmond-Stanislas Aubry, physician and mayor, would be built eight years later. Edmond-Stanislas Aubry was born in Sainte-Scholastique, on July 29, 1860, and raised in Hull. In 1888, he married Marie-Antoinette Charron, daughter of Seraphin Charron, farmer and smith, and Marguerite-Jeanne St-Julien. She was born in the parish of Sainte-Angélique-de-Papineauville, but had moved to Hull by 1872. The couple had some possessions and the husband pledged three properties for the $25,000 dower. They had a son, Raoul, born in 1890, who married Mary-Elizabeth Dunlopp in Ottawa in 1946. On August 27, 1908, Aubry founded the Association Médicale du Comté d'Ottawa (Ottawa County Medical Association), with three other doctors: Dr. Church from Aylmer; Dr. Syneck from Gracefield, and Dr. D'Amour from Papineauville. Aubry was president of the society. He played an active role in Hull's political life for nearly 20 years, serving as Alderman for District 4 (1888 to 1892, 1893, 1898 and 1899), then as Mayor, from 1893 to 1896 and from 1905 to 1907. At that time elections were held every other year and, before 1894, the mayor was elected by the aldermen. Aubry was the first mayor elected by popular vote. He was a member of the conservative professional elite of the city of Hull, which included among its mayors Leduc, Rochon, Champagne and Fontaine. Aubry held several opinions that would not be popular today. For example, in September 1909, he proposed to the Chamber of Commerce that the name of Hull be changed to "Ottawa-Nord" (Ottawa North). In 1907, Aubry made preparations to build a house: he bought the share of the property belonging to his brother, Joseph-George, who lived in Montreal, and had his mother waive her usufruct rights on the condition that she be provided with a room in the new house, which she could occupy, free of charge, for the rest of her life. Aubry borrowed $4,000 from the miner Alfred Larose, of Hull, and mortgaged the building under construction as well as two others in District 3. The Larose heirs would not be paid off until 1948. In 1908, the residence, with its two identical facades, was one of the most beautiful on the street. It became the home of the couple, their son and the doctor's mother. 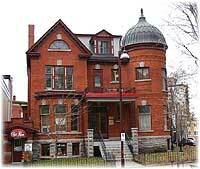 In 1919, Aubry rented a part of the house for ten years to the Banque de Hochelaga (Hochelaga Bank), while retaining the residential rooms. The following year, he drafted his will, naming his wife as sole legatee and executor. He stated that his son, Raoul, was to be paid the insurance due to him, notwithstanding the present will. This is the only mention of his son. The domestic and financial situation was strained, as indicated by Marie-Antoinette's legal statements regarding the preservation of the dower. Edmond-Stanislas Aubry died on October 19, 1936. He left numerous properties, mainly in the townships of Templeton, Low and Bouchette. In 1944, his wife moved into the Saint-Charles Hospice and sold the house to Dr. Joseph-Lionel Pichette of Ottawa, who divided it into rental units. In 1974, Pichette sold it in turn to his son, Gérald, a notary, who would live in the building for several years and who still has his office there. Other professionals, and the florist Chez Rose, have also occupied the building. In 1998, the painstaking restoration of the exterior of the house earned its owner an award of excellence for renovation from the City of Hull. On the interior, the lawyer François Hamon contributed to the faithful restoration of the rooms that he occupies in this Gatineau heritage treasure.